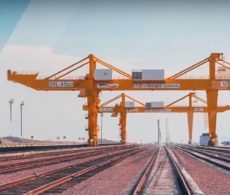 Kazakhstan and China are joining forces for the Chartered Institute of Logistics and Transport’s first Khorgos International Convention. The theme of the event, to be held on 3 September 2018 at IBCB Khorgos, is Logistics & Transport Co-operation for the Belt & Road Strategy. Session Two of the convention is entitled The Role of Kazakhstan in the Development of Logistics and Transport Infrastructure, and will be led by CILT Kazakhstan. The session will open with a presentation by Dr Nurlan Igembayev, Vice-President of Business Development at KTZ Express and President of CILT Kazakhstan. Under the title The Role of Kazakhstan in the Development of Logistics and Transport Systems, Dr Igembayev will discuss the potentially leading role of Kazakhstan in the development of Eurasian transportation and logistics systems, and how this fits in with the implementation of the Belt and Road strategy, and the “Nurly Zhol” state program of infrastructure development. He will also discuss the important role of CILT Kazakhstan introducing an international educational program to develop and improve transport efficiency, enable transport integration, and encourage talent and professional development in the transport industry. After Dr Igembayev, Zhaslan Khamzin, CEO of KTZE-Khorgos Gateway will discuss how improving Kazakhstan’s transport capacities can leverage the nation’s geographical advantages to promote export and increase jobs. Speaking under the title Increasing the Efficiency of the Transit Potential of Kazakhstan by Improving the Transport Infrastructure and Logistics Services, Mr Khamzin will also analyse the role modern terminals will need to play in providing quick transportation of goods from east to west. Closing the session will be Professor Yerkin G. Abdildin of Nazarbayev University who will discuss his work developing Mathematical Model for Solving Optimization Problems in Transportation and Logistics. Professor Abdildin, who is Associate Professor of Engineering, is an expert in Decision Analysis, Risk Analysis, and Computational Science, with a particular interest in applications for energy, biomechanical, financial and transportation systems. The Khorgos International Convention will take place on the 3rd of September 2018 at IBCB Khorgos, and consider the development of Belt and Road logistics and transport infrastructure, alongside schemes, skills and solutions for delivering the Belt and Road initiative in partnership. Keynote speakers for the event are Mr. Wang Derong Professor, FCILT Executive Vice-Chairman, China Communications and Transportation Association, Mr. Kevin Byrne Lieutenant Colonel, FCILT International President, CILT, and Mr. Bakytzhan Kuanyshev Professor, Sc.D., FCILT President-Rector, Kazakh Academy of Transport and Communication. They will be joined by a distinguished selection of session speakers including Song Xuexin CEO, JCtrans Logistics Network Co. Ltd, Zhaslan Khamzin CEO, KTZE-Khorgos Gateway, Shan Yuanzhuang Vice-President, China Association of Policy Science, and Ian Mills Ports & Logistics Consultant, Lawrence Mills Ltd.
Delegates will also have the opportunity to take a Technical tour around the Kazakhstan side of the ICBC including the Railway station, Dry port, and Special Economic Zone, or go on a cultural tour around the Kazakh and Chinese sides of the ICBC for duty free shopping. Get the inside track on Session One of the first Khorgos International Convention.